There is little in this world that a family cannot endure, if endure they must. For we all have it within us to lose everything, absolutely everything, and still find strength in the most simple, beautiful things. Pat and Mandy Retzlaff had always lived a hard but satisfying life on their ranch in Zimbabwe, working all possible hours while raising three boisterous children. From their dining room window they watched game grazing in a nearby field and elephants shaking their majestic heads in greeting. But aside from their children, their real source of pride and joy were always their horses. Then in early 2000 members of President Robert Mugabe’s war veterans began to march on the farmlands owned and worked by white Zimbabweans. Their aim was to take back the land from the nation’s white farmers, dividing the farms into small holdings for the landless, and Pat and Mandy were among the first farmers to be forcibly driven from their homes. To stay could have meant death. Farmers across the country fled the violence, leaving behind not only treasured homes and a beloved landscape, but also dozens of horses. As lifelong ranchers and animal lovers, Pat and Mandy found themselves unable to turn their backs on the horses and so vowed to find a way to save them—as well as themselves. So it was that they found themselves, along with one hundred and four horses, with no other option but to make their escape from Zimbabwe. They were penniless, but they had horses, and each other . . . and a promise to save those they loved. 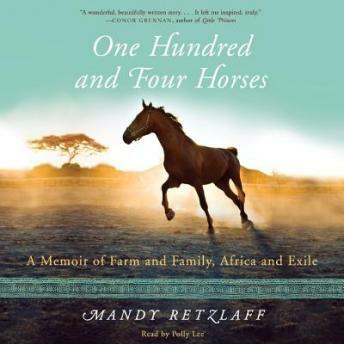 One Hundred and Four Horses is an epic memoir of survival against all odds and the strength of humanity to endure even in the face of the harshest brutality.